You don’t need a plane ticket to trek around the globe; just come to HMNS! Our World Trekkers program is a series of cultural festivals for the whole family, featuring crafts and entertainment inspired by each featured country. Passports will be available to track each attendees’ travels, which will be stamped each visit to verify their cultural comprehension. Please note – this is a members only event. Not a Member? Check out our Member Benefits – including great family events like this! Enjoy a children’s event featuring live entertainment, face painting, a balloon artist, crafts, activities and more. 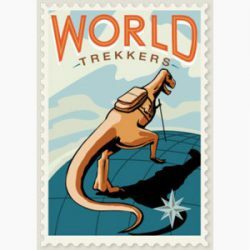 Bring your family to HMNS and you can travel the globe with World Trekkers! The perfect family outing, these events highlight a diverse set of cultures from around the world through entertainment, arts and crafts and more. No need to pack your bags—HMNS brings the world to you with World Trekkers! World Trekkers: Taiwan | Friday, February 1 | 6:30–8:30 p.m.
World Trekkers: TBD | Friday, August 9 | 6:30–8:30 p.m.
World Trekkers passport available for purchase! Have your photo taken, get a sticker for passing through each country and earn stamps for completing crafts.